Regardless of whether your coffeemaker requires a cone or a basket shaped filter, the next choice you need to make is whether to use paper filters or the permanent filters that come with a many coffeemakers. Although a permanent filter will keep the majority of grinds from dripping into your brewed coffee, in general, it is highly recommended that paper filters be used in order to brew the most flavorful, clean cup. 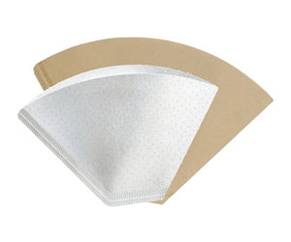 Melitta offers paper coffee filters in white, natural brown and bamboo. Paper filters are the most common and best way to brew coffee utilizing the drip method. Paper filters do the most thorough job in removing particulates and thus effectively trap bitter sediments for a smoother less bitter cup of coffee. In addition, paper filters allow you to use any type of grind while permanent filters require courser grinds. Finer grind coffees have a larger surface area exposed to the water so it provides a richer cup of coffee. Some permanent filters also transfer foreign taste and odor to your coffee. Easy Clean-Up -- Once used, paper filters are easily removed from the coffee maker and then disposed. Permanent filters must be thoroughly washed out after each use. More Sanitary -- Paper filters are used only once. Permanent filters are used repeatedly for years and often develop build-up after repeated use. Potentially Healthier -- Scientific studies have indicated that paper coffee filters play a crucial role in eliminating the cholesterol raising factor of coffee. Permanent filters, on the other hand, allow the cholesterol raising oils to filter into the cup. Environmentally Friendlier-- Paper filters are 100% biodegradable while permanent filters are not. Typically, filter paper comes in either white or natural brown. 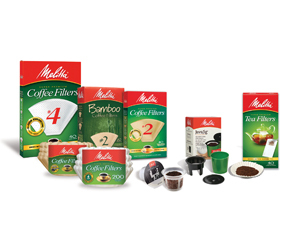 Melitta also offers a paper filter made from bamboo, which is a naturally renewing resource. It should be noted that not all paper filter performs the same. Avoid cheap filters! Cheaper paper filters can impact the taste of your coffee by either transferring foreign flavors and/or via over extraction or under extraction. Other disadvantages of cheap paper are they can easily result in a mess by either bursting or clogging. All paper in its natural form is brown in color. In order to become white, it must be processed. Many filter papers are bleached with chlorine in order to achieve its white color. Melitta coffee filters are Chlorine Free. Natural brown filters are not processed to achieve a whiter color. With premium filter paper, such as those by Melitta, there is no difference in taste from using white versus natural brown versus bamboo. The choice is only a matter of preference. Bamboo coffee filters are made from 60% bamboo and contain patented flavor enhancing technology. Bamboo is a self-renewing resource that grows back when it is cut. The type of coffee filter that you use can easily be as important to the end taste of your coffee as the coffeemaker or water that is used. There are many factors that need to be considered when choosing a coffee filter. If using a paper filter, we recommend Melitta Cone Filters which are the only filters that have patented flavor enhancing micro-perforations that provide a richer more flavorful coffee and are double crimped so they never burst. The type and brand of coffee filter that you use can easily be as important to the end taste of your coffee as the coffeemaker or water that is used. While your coffeemaker may dictate the shape of filter that you need to use, there usually remains many options that you need to choose from that can influence the flavor of your coffee. The shape of the filter that you need to use is dictated by the shape of the filter holder within your coffeemaker. There are two different shapes of holders/filters: Cone (round top gradually tapering down to the bottom) and Basket (circular holder/filter with a flat bottom). In general, cone shaped holders with cone shaped filters are recommended as the design ensures optimal coffee saturation and extraction versus basket shaped holders/filters. The correct size of filter to use is dictated by the size of the filter holder within your coffeemaker. Typically, basket filters fit all six to twelve cup basket style coffeemakers. There are also “Junior” size baskets which are available for four to six cup coffeemakers. Improved extraction results from the concentration of coffee on the bottom of the filter which then creates turbulence as the water hits the grounds thus creating saturation over the entire surface area of the ground coffee. Most higher-end coffeemakers are equipped with cone shaped filter holders.If using a paper filter, we recommend Melitta Cone Coffee Filters which are the only filters that have patented flavor enhancing micro-perforations that provide the perfect extraction for a richer more flavorful coffee. All Melitta cone filters are also double crimped so they are guaranteed never to burst. 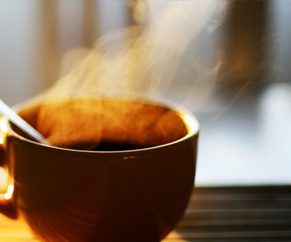 To brew the most flavorful cup of coffee, it is recommended that paper filters be used. Paper filters effectively trap bitter sediments for a smoother less bitter cup of coffee. Paper filters also allow you to use any type of grind while permanent filters require coarser grinds. Other benefits of paper filters versus permanent filters include easier clean-up, more sanitary, and more environmentally friendly. In addition, studies have indicated that paper filters play a crucial role in eliminating cholesterol-raising factors from coffee. Cover bowls or dishes when cooking in microwave. Clean windows and mirrors - Sparkling shine without the lint. Filter broken cork from wine by pouring the wine through a coffee filter to remove broken cork pieces. Recycle frying oil by straining oil through a sieve lined with a coffee filter. Weigh chopped foods. Place chopped ingredients in a coffee filter on a kitchen scale. Line a plant pot with a coffee filter to stop the soil from leaking out. Snack holder - Use to hold servings of popcorn, pretzels etc.